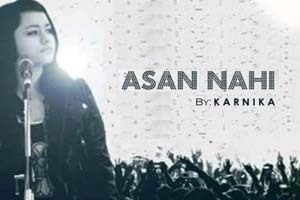 Hindi Lyrics 4 U: Lyrics Of "Aasan Nahi" From Latest Album - Asan Nahi (2016). Lyrics Of "Aasan Nahi" From Latest Album - Asan Nahi (2016). A rock song sung by Karnika featuring her with Abhishek Mehra on Lead guitar, Ashish Sharma on Bass guitar and Amit Kumar on Drums. Features: Karnika, Abhishek Mehra, Ashish Sharma, Amit Kumar. The video of this song is available on YouTube at the channel Star Leight Records. This video is of 4 minutes 21 seconds duration. Lyrics in Hindi (Unicode) of "आसान नहीं"